Nearbuy is offering Upto 40% off on Aquatica Water Park Entry Tickets. Aquatica is a water theme park and resort and it is nothing but acres of unlimited fun! Located in the Rajarhat Township in Kolkata, it is a unique blend of hospitality & entertainment for the whole family. Nearbuy is offering Rs.399 for Entry Tickets to Innovative Film City Amusement Park, Bengaluru. Access to over. Entry Tickets to Over 25 Attractions – Wax Museum, Dino Park & More. 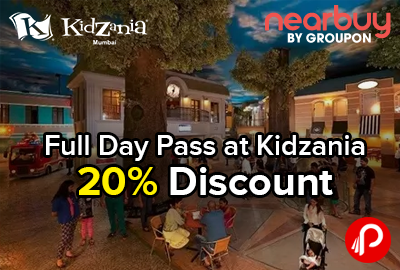 Nearbuy is offering Upto 20% off on Full Day Pass at Kidzania. Valid 7 days a week, Shift 1 – 10:00AM to 3:00PM, Shift 2 – 4:00PM to 9:00PM. Nearbuy is offering Imagica Theme Water Park Ticket Starts from Rs.574 Only. NearBuy is offering UPTO 33% off on KFC Zinger Burgers, Hot n Crispy Chicken, Fries and Beverages. Nearbuy is offering Snooker, Bowling, Pool & More at Rs.119 Glued, Sector 41 Noida. Offer 1: 1 Hour Table Tennis, Offer 2: 1 Hour Pool, Offer 3: 1 Hour Snooker, Offer 4: 1 Hour Pool / Snooker / Table Tennis + 10 Arcade Games. Glued is an Entertainment Center that brings together games with food, drinks and sheesha. Services on offer include:Arcade: Classic Pinball machines to the skillful Fish Catcher to the ego-nising Hammer Power Machine to the conventional classics like Ice Hockey, Street Basketball, Foosball and the latest merchandise catchers – they have all the games to make sure those 50 coins won’t last long. Nearbuy brings Travel Flash Sale and offering Flat 30% Cashback on all Hotels and Travel Destinations. Nearbuy brings Love at first sight sale offering Flat 25% Cashback on Valentine’s Collection including Romantic Dinners, Drinking Places, Grooming Offers, Gifting offers & Many More Deals. Nearbuy The Big Adventure Sale and Activities Sale offering Flat 30% Cashback on Outdoor Adventure Activities Deals, Kids Zone Deals, Parks & Water Parks Deals, Games & Arcade Deals. Valid 19th & 20th Jan, Maximum Cashback upto Rs.500. Nearbuy is offering Upto 52% off on Momo Cafe Courtyard by Marriott Mumbai. Courtyard by Marriot is strategically located in the heart of the central business hub of North Mumbai, MoMo Café is the all-day, on-site dining restaurant which offers Pan-Asian, Western and Indian cuisines along with a fine selection of drinks. This buffet restaurant features food all day long in a casual, contemporary setting that’s ideal for intimate gatherings. Nearbuy is offering Upto 25% off on 4 Tickets in EsselWorld & Water Kingdom price starts Rs.2097. EsselWorld is an excitement and entertainment packed park that offers fun for everyone! The park features heart racing rides, a bowling alley, 3400 sq. ft. ice skating rink, dance floor and more. The 22 acres water kingdom is the ideal family play port and features 3 kiddie slides, 4 family slides, 3 adult-thrill slides. Nearbuy brings 100% Cashback on Deals, just Buy 4 Coupons Get 4th Free. Minimum Purchase of 4 Vouchers. 100% Cashback on 4th November. Nearbuy is offering Flat 50% off on EsselWorld & Water Kingdom Entry Ticket Starting just Rs.349. Blackout Dates: 8th, 9th and 10th July 2016, Valid for adult & children tickets only – Not applicable for Sr. Citizens. Valid from 05-May-2016, Valid until 05-Oct-2016. Nearbuy brings Wow Weekend and offering UpTo 80% Off + Extra 20% Off on food, drinks, spas, movies & more. Maximum Cashback of Rs.200, Valid till 4th September 2016. Nearbuy Hello Weekend is offering Flat 15% Cashback on all Nearbuy Orders. Maximum cashback of Rs.150 only. Nearbuy brings Independence Day Special offer and offering Flat 70% on Country Inn & Suites By Carlson, New Delhi Just Rs.1999. Offer till 12th to 20th Aug only. Nearbuy offers Dominos Pizza Voucher worth Rs.500 in Pay Only Rs. 299 . + Extra 1% off on Payment through PayUMoney Gateway. Valid for 1 transaction only, Valid only for Online orders. Valid from: 17-May-2016, Valid until: 30-Sep-2016. NearBuy is offering Flat 50% on Mainland China Restaurant Voucher at Rs.400 in Mumbai. Open Voucher worth Rs.800. one roof – from the streets of Hong Kong, Singapore, Malaysia, Thailand, Japan, Korea, Myanmar and of course, China. In a happening format with a live kitchen, it adds an exciting new dimension to Mainland China.